Trust is the ability to have confidence or faith in a person, team or process. It’s happened to you in the past. You prepare a presentation for your new project at an upcoming board meeting; you‘ve communicated to your peers your intentions yet there’s a little voice telling you that someone, perhaps Johnny is going to sidetrack your presentation even though you’ve sufficiently briefed him before the meeting. Your current boss told you Johnny is being groomed to become your boss but this isn’t official yet. You give the presentation your best shot and all of the sudden Johnny takes ownership of the discussion and disagrees with your strategy and tactics. He suggests to the board that he will work with you on how to improve the content and direction and you will present at a later time. Clearly, he didn’t support your project. What happened? Well it could be an issue of trust here or lack thereof and well, Johnny just doesn’t trust your intentions. At face value he agreed but did you dig deep enough to make sure he understood what he was agreeing to? Have there been any conflicting issues in the past that were not resolved and may come up again? Perhaps you’ve given signals that you don’t trust him and you don’t endorse his promotion. This is what I call a “trust wakeup call”. 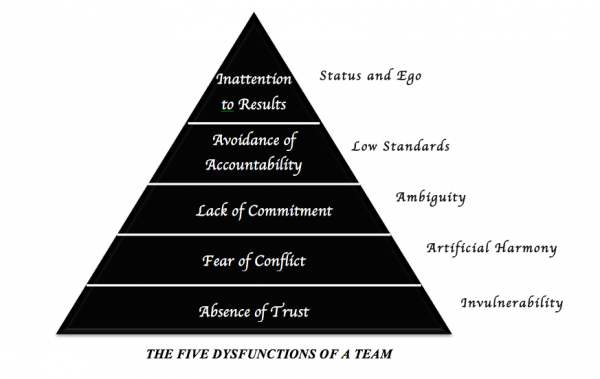 After reading Patrick Lencioni’s book called “The five dysfunctions of a team” I quickly identified trust issues with a renewed sense of awareness. Here’s another example of one of my clients who encountered a similar delicate matter. My client, we’ll call him Bob is the Marketing Director. His peer – let’s call her Alice, she’s in charge of the legal department and as such, supports the Marketing team in the areas of patents, contracts with suppliers and regulatory affairs. Both agreed on how to deal with a difficult employee who was reporting to Bob. Two days later Alice is in the CEO’s office commenting on the poor performance of this employee and that this employee should be dismissed. At this point the CEO calls Bob with Alice in his office and asks why are they tolerating this employee’s behavior? Bob was shocked. He explains that he’s set up an action plan with Alice. The CEO is not listening; he’s visibly upset and now he’s demanding for a quick solution. Bingo! Here’s that lack of trust we’re talking about – Trust is the ability to have confidence or faith in a person, team or process. Alice has heard these stories before from Bob. She doesn’t believe he will deliver. Trust is the foundation of real teamwork according to Patrick Lencioni. Trust is the most fundamental part of a 5-part triangle – Trust is at the bottom and team work starts when team members can trust each other…it’s that fundamental. Most people would let the Bob scenario above ‘fester’ akin to letting an infection under your skin change color because you avoided seeing a doctor, rather than facing Alice that day and dealing with this. By letting it fester, this develops in a cold war only to re-emerge again later when Bob has the upper hand and it’s time to let his peer have it. I suggest many times to my clients to “face up to it”. “Have a chat with Alice”, I told Bob and politely ask her: Can you please tell me what happened Alice…what part of the action plan did you not understand? Then I suggest to Bob to hold back from saying anything; stay quiet; listen and to let her speak. In my view “this is nothing that a conversation can’t fix”. I tested the situation a few weeks later by asking, “So, did you get closure with Alice”, to which Bob replied… NO. If I’m lucky and Bob feels courageous to enhance his assertiveness skills, to call out his peer when it’s time and to build trust, we agree on a plan to get closure. Bob is motivated and tells me that the likelihood of dealing with Alice is 8/10, that is, he will do this by our next meeting. That is not the solution because festering facilitates this frustration which will come up again and again. I told Bob, during this crisis the trust level between you and your peer broke down. This affected productivity, morale and created a tension where you and your respective team members were keeping their heads down. This was a tremendous waste of time, efficiency and creativity. When it comes to analyzing and facilitating trust, Brain Science tells us that trust is broken down by fear (ex. losing one’s job, making mistakes, damaging or losing assets). Fear is that ”always-on” emotion that is controlled by your amygdala. Your amygdala (a pair of small organs in the brain) is the fear and emotion center in your brain. It’s the area that prepares your eventually for “fight or flight”. In its most simple terms if the amygdala is activated or overheating because of fear, this will also affect other parts of your brain which essentially tells you, either Go or No Go or in other words, to carry on a particular task. 1. Bob has to stop what he is doing and meet Alice as soon as possible. Why? The incident is fresh and it’s best to get this resolved now instead of letting it fester. Do what most wouldn’t do; deal it with now. This requires courage. 2. If Alice is not available, agree to meet later that day. 3. Bob to follow the “Giving feedback” structure. Indicate how this situation made him feel. Bob believed that something happened…what happened exactly? Get Alice’s view and Bob should listen actively – he should not interrupt. Did he cause this somehow? If he did, he must communicate that he wants to rebuild the relationship. 4. Once both parties have said their say, Bob should state the reason this is happening is because there’s an absence of trust in their relationship. Bob should press upon the need to trust each other as they are expected to work together. 5. If Bob made a mistake during the “Giving feedback” session and he knows he was wrong, he should apologize. An apology for his flawed and frequent behavior is the only way to erase the negative baggage associated with prior action. Lastly, Bob should be honest and sincere. Why? It only makes sense. People will feel that he is hiding things and will respect him as a leader if he communicates without hesitation. Aiming for trust doesn’t have to be difficult. Great leaders will generate trust based on how they conduct themselves, their principles, their leadership qualities, and if they demonstrate fairness and honesty when they’re required to support peers or team members. By being aware that trust is at the root of many workplace conflicts, you also realize that trust can be a dark cloud or a motivator. By addressing trust head on with courage and engaging in a dialogue when conflicts occur you may discover that removing fear by instilling trust will give you an exponential effect on team morale and performance.